Got some stuffed animals in your household that need fixing up? Our Deluxe Doc Mcstuffins costume is going to bring your little one into the prestigious field of stuffed animal care and well being. They can stitch them up, help with their problems, and otherwise make them well again so everyone can enjoy them for many years to come. 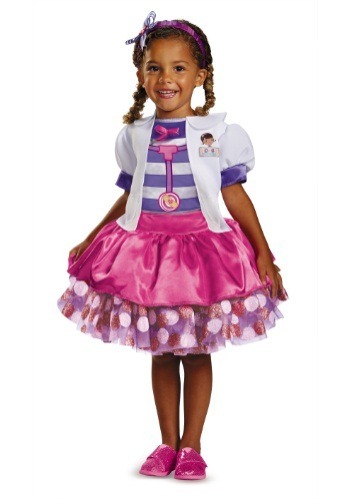 Our Doc McStuffins costume for girls is a fun costume for Halloween or play time for any young fans of the Disney Channel show. Do you need a cuddle? Then Lambie is just who you need! This Doc McStuffins Classic Lambie Costume lets your little girl become Doc's best friend. She loves hugging her friends and hopes to become a ballerina. Get ready to host a tea party--she loves those, too! Who else can calm down stuffy if a spider walks into the room? Who's going to help Lambie if she gets sick? Who else can get Hallie ready for another busy day of nursing? Your little girl, that's who! With this Doc McStuffins costume, your girl can get into the role of stuffed animal doctor, just like her hero from the Disney series.